It got pretty wet up here. I'm up here for a medical procedure, staying with my mum and sister, Dr Tabubil, in my sister's apartment on the river. Dr Tabubil was lucky - she and Mum rode out the floods safely on the Gold Coast. And after all those days of living the flood vicariously on the television and over the interwebs, her building in Brisbane was NOT flooded out - the residents sandbagged and watched the water lap at the door and organized bucket brigades for if and when it rose and reached the electrical junction box (housed on the ground floor, naturally!) For two days, every healthy resident was downstairs sandbagging or moving all the files and furniture in the manager's office to higher ground and the building manager, when Dr Tabubil talked to him, was quite concerned for several elderly people who shouldn't have been sandbagging but had insisted on doing so and were now having some heart trouble… But they made it through without anything more than minor palpitations. But the designers of the buildings to either side had the genius to site the electrical and elevator control rooms in the basement. They will be out of power for a fair while, it's reckoned. My aunt and Uncle spent the flood living in a fair zoo, opening their house to flooded-out friends and relatives. My ballet-mad 13 year old cousin though the flood was seventh heaven - one of the refugees was a genuine ballet dancer from the Royal Australian Ballet who'd come to town for a teaching conference - guess who ended up being the student demonstratee at the conference later in the week? We've heard of only one friend - so far - who went under entirely. She and her husband were given enough warning to round up friends and salvage the photographs and important papers and hump whatever furniture they could up to the second floor. They're shrugging their shoulders and saying "we'll rebuild." Nothing much else they can do. The daughter of a family friend raises horses on an 11 acre property in the Lockyer valley. On the day before the floods she had been rushed to the Ipswich Hospital after being kicked by a horse. She was released - after many tests - with severe bruising and a quantity of morphine for the excruciating pain. On Monday evening, she was given 25 minutes by the State Emergency Services to evacuate their home. She and her husband and twin baby sons made it to a property on a hill 2 miles away from their house and sheltered there with 15 other refugees while an 8 meter wall of water roared through the valley. They spent three days there, watching the water swirl past. On the first night, she ran out of morphine. I understand that it was a pretty rough three days for her. Her frantic father tried to arrange for an emergency airlift by helicopter, but the helicopters were rather more pressingly engaged picking survivors out of trees and off of submerged buildings. But then - hallyluyah hallyluyah!! When the waters went down they went home and found their house standing. Two houses down the road, all that's left is a foundation buried under a pile of rubble; at her place, the water came up the drive and stopped - twenty centimeters from her back door. The property at the end of her road lost 51 horses - every single one of her horses rode out the flood belly deep in a hill-paddock. I flew up here on Monday - the flight was full of cheerful young men wearing construction boots and toting hard hats - apprentices sent up by their bosses to lend a hand wherever they were needed. Our town sent an S&R team. On the weekend ten thousand local residents turned out to sweep and scrub and tote wreckage. And the CBD, at least, looks damned good. Mum and I took a wrong turning off of Anne St. yesterday morning on our way to the doctor and drove through the formerly flooded zone - the disaster crews have hosed down the streets, and buildings that we'd seen on the news waist deep in water were now sparkling in the sun - the only evidence of the flooding were the building lobbies cordoned off with incident tape, and the tankers trucks lining the streets - pumping out basements and sending fountains of muddy water in the street. We do all right with the mopping up, we Australians do. We're doing all right. Yesterday afternoon Mum and I drove into St Lucia, down by the university. I took a few photographs just before yesterday's enormous storm hit (we only felt the edge of it - no hail or trees coming down where we were, thank heavens!) Unfortunately my laptop here won't recognize my memory card - on the weekend I'll go buy a cable for it and THEN I'll post the pictures. Edit: the uploaded photos can be found here. And here. 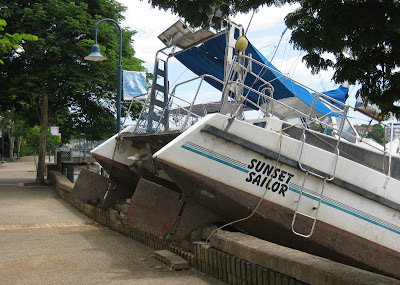 St Lucia got hit HARD. Driving through the suburb, the flood stopped being vicariously awful and faintly thrilling and we just felt sad, and sick in the stomach. Convoys of army trucks. Convoys of cranes and fire engines. Houses that had gone under totally, weed hanging from the gutters and windows hanging from their sashes. Buildings with the flood line (and it's a very clear line) sitting well above the start of the second storey. Junked cars. A park that has been turned into a giant rubbish skip - a whole block of crumpled furniture and fixtures as people have just had to strip their whole lives out of the shells of their houses. A marquee on a corner - serving up hot-dogs to people in muddy shorts and construction boots, who stood and ate, heavy, empty eyed, and rolled their shoulders and crimped their necks and headed back into those ruined houses. There's an electrical storm outside right now - lightning going like a disco ball. I'm turning the computer off. At least the rain will help wash off the houses.